Strict orders issued. This must not be called a V-1M or Flying Bomb or Buzz Bomb. The MiG-29 fighter (type 9-12A) that crashed had the Polish side number "4103" and was one of the former fighters of this type of GDR Air Force (number 699), and then the Air Force of Germanyhanded over by Germany to Poland in 2003. As Polish media reported, in early November 2018, Polish National Defense Minister Mariusz Blaszczak approved the schedule for the formation of the fourth regular division of the Polish Army, which is planned to be deployed in the eastern part of the country near the borders with Belarus and Ukraine - the 18th Iron Mechanized Division (18. "Żelazna" Dywizji Zmechanizowanej). At present, the Polish ground forces include three divisions (the 11th armored cavalry and the 12th and 16th mechanized), consisting of a total of ten brigades, as well as six separate brigades. The fourth existing division (1st Warsaw Mechanized) was disbanded in 2011 (four divisions have remained in the Polish army since 2001). However, due to increased tensions in Europe, in 2016 the Polish Ministry of National Defense decided to deploy the fourth division in the eastern direction, and its formation has now turned into a practical plane. 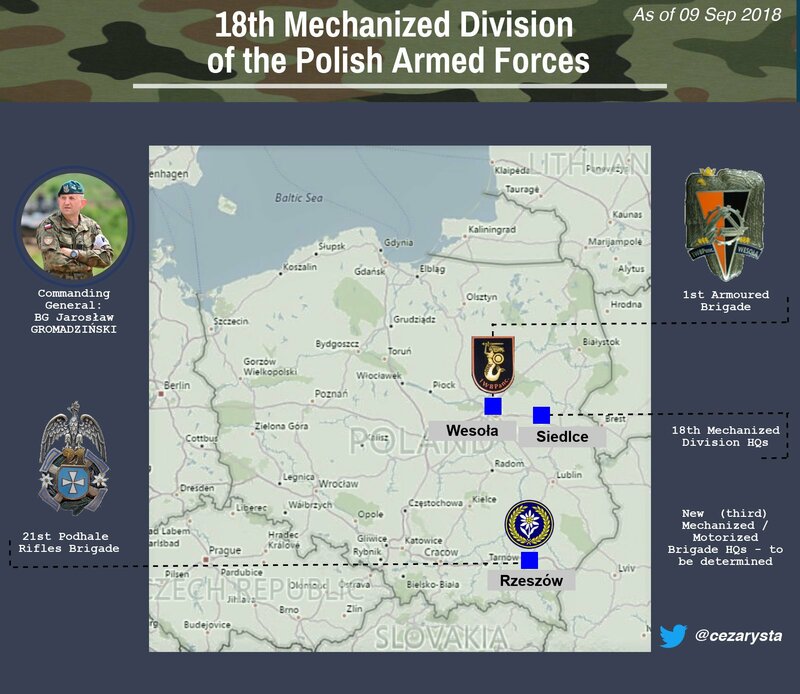 The control of the 18th mechanized division (including the 18th control battalion) was activated on September 17, 2018 (the 79th anniversary of the entry of the Red Army on the territory of Poland in 1939) in Siedlce (Masovian Voivodeship, 50 km east of Warsaw). plan, the management of the 18th division should be deployed by the end of 2018, and by September 2019 the main command structures of the division will be established. By the end of 2019, the 18th Division will include two existing brigades - the 1st Warsaw Armored Brigade named after Tadeusz Kosciuszko (1 Warszawska Brygada Pancerna im. Tadeusza Kościuszki), stationed in Vesola (Warsaw) and part of the 16th the mechanized division (the 16th division has four brigades in its structure, so the withdrawal of one of them will lead the division to the “normal” standard), as well as a separate 21st brigade of the Podhaler shooters named after brigade general Mechislav Borut-Spihovic 21 im. gen. bryg. Mieczysława Boruty-Spiechowicza), in fact - mechanization located in Rzeszow in southern Poland (Subcarpathian Voivodeship). In this structure, the 18th Mechanized Division must reach combat readiness in the first half of 2021. The commander of the 18th mechanized division was appointed Brigadier General Jarek Gromadzinsky, previously the deputy commander of the 12th mechanized division, and took office on 9 September. Also as part of the 18th division, beginning in the fall of 2019, the formation of the third new mechanized brigade should be carried out, which should reach combat readiness by mid-2022 and which is planned to be deployed in Lublin. According to several reports, for this purpose it is planned to restore the 3rd Legionary Mechanized Romuald Traugutt Mechanized Brigade, which was disbanded in 2011, which was previously located in Lublin. The formation of divisional units of the 18th division (including the reconnaissance regiment, artillery regiment, air defense regiment, etc.) will be carried out until 2026. In general, the cost of forming and equipping the 18th mechanized division is estimated by the Polish Ministry of National Defense at 27 billion zlotys ($ 7.1 billion) over ten years. It should be noted that the Polish 18th Infantry Division distinguished itself in the hostilities of 1919-1920 and 1939, but the division with this number did not exist in the Polish Army after 1939. On February 28, 2019, the Minister of National Defense, Mariusz Blaszczak, approved a new ten-year prospective technical modernization plan for the Polish Armed Forces (Planie Modernizacji Technicznej Sił Zbrojnych - RMT) for 2017-2026, which is a kind of Polish analogue of the Russian State Armaments Program (LG). Under the new plan presented by Minister Blaszczak at a ceremony in Warsaw, a total of 185.1 billion zlotys (about 48.8 billion dollars at the current exchange rate) is expected to be spent on the purchase of weapons and military equipment for the Polish armed forces in a ten-year period. Minister Mariusz Blaszczak, introducing the new RMT, said that one of the priority purchases under this plan is the acquisition of 32 fifth-generation fighters for the Polish Air Force as part of the program under the code Harpia. “I expect that both the chief of the General Staff and the chief of the weapons inspection will immediately take action to complete this task. This aircraft is very important because it enhances the combat capabilities of the F-16 aircraft currently in use. We are determined to replace the former Soviet aircraft, which have no combat value and are worn out. The tragic incident last year, when the MiG-29 pilot died, also makes the Harpia program for purchasing fifth-generation airplanes our priority, ”the Polish minister said. Further, Blaszczak said: “Why the fifth generation? Because we want to make a qualitative leap in terms of the armament with which the Polish army is equipped. Just like many years ago, such a qualitative leap was the purchase of F-16 aircraft, now the purchase of fifth-generation aircraft will be a breakthrough. It will be the ability to interact, which will significantly increase the deterrence of the enemy. " As it is easy to understand, under the fifth-generation fighter aircraft are meant American Lockheed Martin F-35A Lightning II aircraft, since there are no other offers on the market. These aircraft should replace the obsolete Soviet Su-22 fighter-bomber and (secondarily) MiG-29 fighter jets as part of the Polish Air Force. Officially, the cost of the Harpia program is not reported, but Polish observers in the case of the purchase of F-35A is estimated at least 20 billion zlotys (5.27 billion dollars). 2026 - 30.8 billion zlotys. Thus, it can be noted that the Polish plan does not reproduce the best feature of the Russian LG in the form of crafty allocation of most of the expenditures for the second five years of the program implementation (in the Polish version for the last five years, PLN 121.2 billion accounted for 185.1 billion essentially two thirds of the cost). The already mentioned promising integrated air defense and missile defense system of the country under the code Wisla, which, according to Polish media estimates, is supposed to spend up to 50 billion zlotys (13.18 billion dollars) in the specified period, will be the largest part of the expenses of the new RMT. 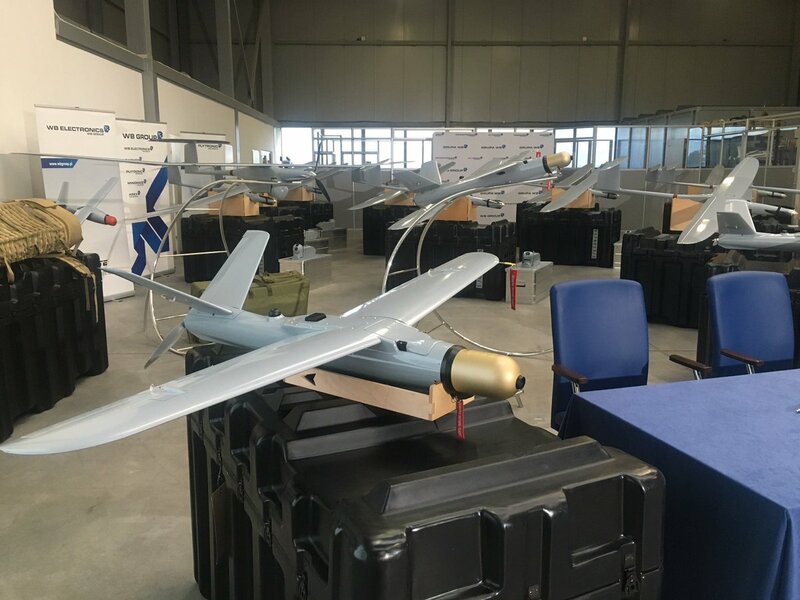 Also among the 16 priority programs publicly listed by Minister Blaščák under the new RMT are the mentioned procurement program for 32 fifth-generation Harpia fighters, projects for acquiring short-range air defense systems Narew, combat helicopters Kruk, tactical UAV Gryf and small UAV Wa приобретенияka. In the interests of the Navy, priority plans are being given to the acquisition of three non-nuclear Orka submarines, multi-purpose frigate / corvette Miecznik-class surface ships and basic patrol and reconnaissance (radio and radio intelligence) aircraft Płomykówka. In this case, the commissioning of submarines and surface ships, apparently, will occur already outside the scope of the new RMT (that is, after 2026).